Below is a tribute in memory of Fran McDriscoll which was printed in the Scoil Muire Doireglinne annual school magazine, Flashpoint 23. We remembered and prayed for Fran in our First Holy Communion Ceremony on 28 th May 2011 also. She is fondly remembered and dearly missed. Our dear friend, Fran McDriscoll passed away this year on 24th January, 2011. Suaimhneas síoraí di i measc na naingeal i bhflaithis Dé. Fran has shown a great interest in our school and our children’s education. She has supported us in many ways throughout the years. Fran kept up-to-date with all our school events and activities through emails with our teachers, visits to our school on each one of her Ireland trips and Fran was a regular Flashpoint reader. In fact, we sent numerous copies of Flashpoint Stateside every year, which she passed on to her friends. Fran has been a generous benefactor to our school since 1998 and many of her friends have joined her with donations to Scoil Muire. We appreciate Fran’s support which has enabled us to cater for and enhance the educational opportunities of our children. I have met up with Fran each time I have been in Boston either in her office at First Realty Management Corp overlooking beautiful Boston Common and with a view onto the Charleston River, at her home with a real ‘Irish’ flair or more socially for a bite and a few! I have had the pleasure of meeting many of her work colleagues and friends. Fran McDriscoll, 64, died unexpectedly but peacefully on Monday January 24th, 2011 in the company of her dear companion. She leaves behind the love of her life, her dear Aunt Joan, a wonderful God Child Jessie, and many friends and family members here, in England, France and Ireland. For the past 27 years Fran has been a devoted professional at First Realty Management in Boston Ma. Writing witty short stories, The New England Patriots, The Boston Red Sox, and all things Irish were among her many passions. Fran loved Saint Patrick’s Day and was well known for her annual celebration of the day. It being her grandmother Sarah’s birthday gave this day great significance in her life. Those closest to Fran ask that anyone wishing to celebrate her life, honor her in the manner of their choosing alone or with loved ones on or around March 17th, 2011. 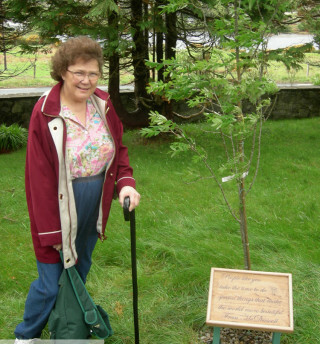 She loved the children of the Derryglen National School in Derryglen, County Galway, Ireland and was a generous benefactor. Donations in her memory can be made to Derryglen School c/o Whitney Moran of First Realty Management Corp, 151 Tremont Street Boston, Ma 02111. Her remains will be laid to rest in her beloved Ireland.